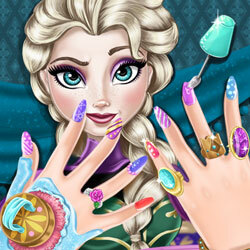 Description: Discover the beautiful and colorful world of manicure in Ice Queen Nails Spa. The queen’s hands are most important because they hold magic ice powers. As you know, cold can really damage your skin so start by applying beauty spa treatments on her snow-white hands and make sure you moisturize them. Choose the nail shape and go crazy creative with patterns, nail polish and sparkly accessories, the queen will love your ideas and the whole kingdom will be mesmerized by her amazing nail art.